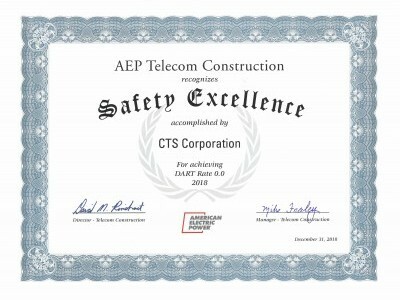 CTS is honored to be named one of multiple contractors to receive AEP Telecom Construction’s Certificate of Safety Excellence for achieving a DART Rate of 0.0 for Construction related activities in 2018. DART is a measurement of workplace injuries and illnesses that result in time away from work, restricted job roles, or permanent transfers to new positions. CTS is committed to safe work practices to protect the environment, the infrastructure and our people and continue to work towards the goal of zero accidents. About AEP: American Electric Power, based in Columbus, Ohio, is focused on building a smarter energy infrastructure and delivering new technologies and custom energy solutions to their customers. AEP’s approximately 18,000 employees operate and maintain the nation’s largest electricity transmission system and nearly 220,000 miles of distribution lines to efficiently deliver safe, reliable power to nearly 5.4 million regulated customers in 11 states. AEP also is one of the nation’s largest electricity producers with approximately 32,000 megawatts of diverse generating capacity, including more than 4,300 megawatts of renewable energy. AEP’s family of companies includes utilities AEP Ohio, AEP Texas, Appalachian Power (in Virginia and West Virginia), AEP Appalachian Power (in Tennessee), Indiana Michigan Power, Kentucky Power, Public Service Company of Oklahoma, and Southwestern Electric Power Company (in Arkansas, Louisiana, east Texas and the Texas Panhandle). AEP also owns AEP Energy, AEP Energy Partners, AEP OnSite Partners, and AEP Renewables, which provide innovative competitive energy solutions nationwide. About CTS: CTS Construction is a privately held Data Infrastructure Construction company headquartered in Cincinnati Ohio, providing both inside and outside data networking installation services throughout the Midwest.